Hong Kong mission accomplished. As disappointing as the Barbarians were this was an emphatic performance from Warren Gatland’s Lions and a first outing that will please him and his coaching team immensely. The professionalism and enthusiasm shown from the start to the finish of the Hong Kong week from this Lions set up has given us an inkling that not only do they mean business but they have an idea about doing it the right way too. In stark contrast the Barbarians, already with one heavy defeat under their belt against England seconds the week before, looked an expensive question mark as they failed – Joe Rokocoko aside – to put up any real resistance. Take nothing away from the Lions. With the form Welsh players all putting their hand up and revelling in the occasion (a seemingly muted, corporate one at that!) , a game plan that developed as the game went on, and a set piece that showed foundation. Fortunately I can pretty much say what I like in this Blog, and credit where credit is due Mike Phillips was outstanding in this first game. When he puts this Lions shirt on he shows any other player what it means to him. He played with conviction and intelligence for me, as well as his usual fighting competitive spirit. Jamie Roberts too stepped up, as did Justin Tipuric – again. I am lucky enough to have some coaching software to watch the individual players instances and statistics in more detail, and even though it was no surprise to me, Justin again did the little things very well. He is such an intelligent footballer and he is just getting better. He creates space, wins subtle turnovers, plays half back when needed, clears out important rucks and runs sublime support angles. It looks such a strong team again that has been picked for Game 2 against Western Force. It will be interesting to see how combinations fit together. 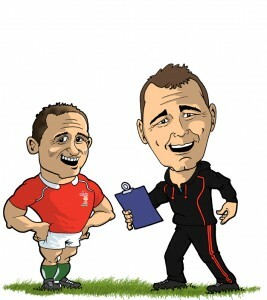 Roberts and Davies clearly go well together in the centre but O’Driscoll and Tuilagi is a mouth watering prospect. Not a bad Back 3 is it ? Halfpenny, Bowe, North!!! Interesting to see George used in the centre off set piece against the Babaas. I will be keen to see who has the kicking duties on Wednesday with Halfpenny the highest percentage kicker in the Six Nations surely pulling rank over Sexton? Neil Jenkins knows his stuff and will have his say in that department. Dan Cole has a chance to put himself on the map – he has to or forever be in the shadow of the immovable Adam. So pleased to see Rory Best out there – hope he goes well – alongside Cole and the destructive Healy he should continue his form and with the Dynamic Duo of Ian Evans and Alun Wyn Jones behind them (I’ll let them 2 decide who is Batman and who is Robin!!) then the back row should have some fun. This looks like an entertaining back row with the form of Heaslip, the gazelle-like athleticism of Croft and the highly player-rated O’Brien in harness – who’d dare pick the First Test team just yet??!! But hold on a minute – Western Force? Before we get too carried away we have to assume this will be a much more organised and sterner test for the tourists. The Babaas missed a huge 25 tackles in Game 1. 14 clean breaks were made by the Lions with 25 defenders beaten. They conceded 14 penalties to the Lions 5. These are the statistics that the first Aussie provincial side will look to turn around to make things a touch more difficult in Game 2. The Lions used the short side well on Saturday – probing in the far 15m channel with the likes of Richie Gray carrying well. With Phillips and Roberts then looking a threat the defence was stretched later phase and as the offloads came, it was only a touch of over exuberance, some Rokocoko defence and the sweaty conditions that kept the score down. Shane and I take off on the 15th – the little man is enjoying some time in Japan with his club before hooking up with me for our 3 week tour. In our next Blog, check out Shane’s thoughts on the performance versus Western Force and how he’s looking forward to being in Australia. A big hello to all those supporters already out there and those, like us, gearing up the go.